Russian ambassador Harold & Kumar picture: Airplane "terrorist" illustrates ISIS argument. Kal Penn as Kumar as a terrorist. Russian ambassador to the U.K. Alexander Yakovenko chose an unusual image to illustrate a tweet about terrorism earlier today. You might recognize that terrorist: It’s Kal Penn, American actor and co-star of the Harold & Kumar comedy trilogy. 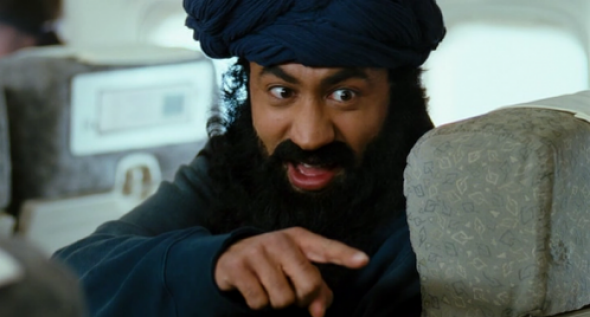 If I have my Harold & Kumar-ology correct, that’s an image from a scene in the second film in the series, Harold & Kumar Escape From Guantanamo Bay, in which a paranoid white airplane passenger hysterically perceives Penn’s character (who is actually an American of Indian ancestry) as a swarthy Middle Eastern terrorist. In the film, both Harold and Kumar are eventually imprisoned at Guantanamo by overzealous government officials. In other words, the Russian ambassador used an image from a satirical film about the fear-mongering political excesses of the war on terror to make a dubious and fear-monger-ish political point involving terrorism.